Cornerstone Crossroads Academy is a second chance nonprofit high school in the South Dallas area of Dallas, Texas. 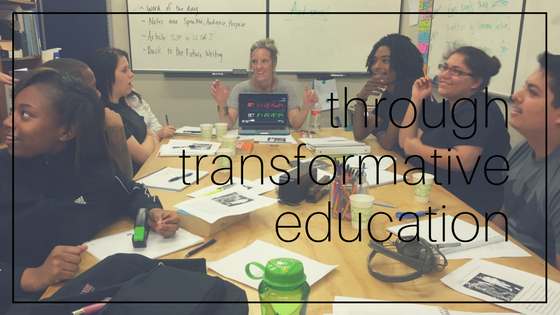 The mission of CCA is to develop urban youth through transformative education, equipping future leaders to impact their communities for Christ. The words, “Blessed are the poor” swirl around in my soul like warm breath in icy winter air. It’s the contrast of warmth and chill, joy and suffering, poverty and plenty. One is impossible without the other. In the middle of brokenness, failure, and need, there is a healing and reliance – even desperation – for Christ and a community of support that fills up and overflows and . . .
As staff, we each have our own reasons to give our time, talents, and treasure to Cornerstone Crossroads Academy. In addition to serving the students of CCA, we are also devoted to supporting other organizations. Join our crazy crew in giving on North Texas Giving Day! We just witnessed 12 more students become CCA graduates! Our founders, Jim & Jane Beckett, were there, along with many family, friends, volunteers, and community members! We had the opportunity to go to Guatemala with HELPS International USA! We installed 51 stoves and 8 water filters and had so much fun along the way. I am so excited to share that Cornerstone Crossroads Academy has the opportunity to go on its first international mission trip! Educators are known for our affinity for tests. “Pay attention – this will be on the test!” Standardized tests, teacher-made tests, benchmark tests, entrance tests . . . are you sweating yet? But did you know that we get tested, as well? Luke 4:18-19 is a clear mission for the CCA staff. Good News – the hope of the gospel – freedom – sight – favor with the Lord! What a joy to share this message with our students! The Lord has been so gracious to provide us with multiple ways to accomplish our mission. This school year, He has done so through a new course. As we seek to encourage and improve literacy at CCA, we ask you to join us by making and mailing encouraging bookmarks! In spite of the various obstacles she faced, Joy says that she realized the importance of education. Her desire to complete high school and her diligence to push through helped Joy accomplish her goal. Serena feels that deciding to attend CCA was one of the best decisions that she's ever made. Serena admits that she was skeptical about going to a Christian school, but she has learned more about and grown closer to God since coming to CCA. Crystal was referred to Cornerstone Crossroads Academy by our former principal Ms. Sally. After hearing a little about it, Crystal decided that she wanted to discover CCA for herself. Josh says that being at CCA has been a life changing experience for him. He credits this to the CCA family atmosphere, stating that the staff and the other students have always been helpful and have never given up on him, no matter what happened. Darion came to CCA in 2016 after seeing his older brother Quinton (c/o 2010) come to CCA and successfully earn his high school diploma. Darion thought, "If this worked for my brother, it will work for me too." Ashley knew Ms. Kristi long before she became a CCA student. Growing up in the neighborhood, she went to the Cornerstone After School Program right next door to Cornerstone Crossroads Academy. Maya came to CCA in 2017, wanting to finish her senior year of high school. She saw Cornerstone Crossroads Academy as her last option. Now, she realizes that it was the second chance that she needed. Lisa Doolittle is the driving force behind CCA's inaugural art class. As we shared in our recent post, "Art Appreciation," this class has tremendously impacted our students' lives. But it doesn't stop there! Hear how God has changed Lisa's life through her involvement at CCA. Sign up to receive CCA news and updates.